I wrote this article for The Guardian. It seems to have caused a bit of controversy…600 comments and counting. I’ve been reading below the line and howling my head off with laughter. I’ve been called ‘part of the 1%’ because I’m prepared to pay almost a fiver for a jar of tomatoes. Check out the Guardian facebook page for even funnier remarks. For preserving it’s best to use a firm fleshed tomato with few seeds and little juice that can withstand the canning process. Neopolitans believe the best tomatoes are grown around Naples, aided by the volcanic soil of Vesuvius. Roma are a generic plum tomato frequently used outside of Italy. Corbarino, from Corbara in Campania. San Marzano tomatoes, originally from Naples, are the most well known. Look for the Protected Designation of Origin (DOP) label because there are many imposters. Torpedino is a mini version of San Marzano. Cosi Come yellow: 7/10 ‘colour puts me off’ said Dino. Cirio: 4.5/10 ‘sweet’ ‘tastes like a leather book’ according to Joe. These did better cooked. I sapori di corbara sua eccellenzia: 8.5/10 but the winner when cooked. What did I do with the rest of 21 open tins of tomatoes? I cooked up a massive tomato sauce which I boxed up for the freezer. I want to try that. Many chefs are including the vines in tomato sauce now, to extract more flavour. So yesterday I used just the water from i sapori di corbara tomatoes. 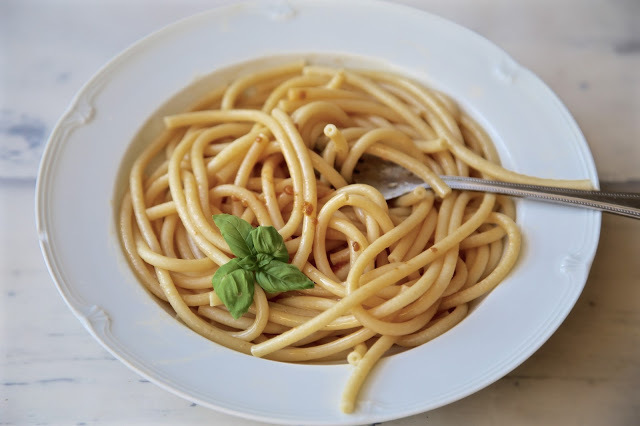 In a good saucepan (I use a copper saucepan from Mauviel, this really makes a difference to cooking sauces) heat up the olive oil, add the garlic, soften, then add the tomato water, the basil and the salt. Cook for five or ten minutes while the pasta is cooking. Drain the pasta and mix it with the sauce. Depending on what I’m cooking, I’ll buy a cheaper supermarket brand (especially as I live nowhere near Chelsea where the winning tomatoes are sold) especially if it’s just for a curry or chilli where the pure taste of tomato is masked. My interest lays in food and drink, so that’s what I spend my hard-earned dosh. I come from a background where my family spent their money on interesting travel and food, while some of their friends forked out for first class hotels, designer clothes, handbags, posh cars, a big TV – things I would regard as ‘status’ buys. Spending over £50 on a handbag that might get stolen or over £20 on sunglasses that you will lose is a waste of money for many but everyone has their own priorities. What goes in my mouth, my body is very important. In Italy and France people spend a far higher proportion of their income on food than the British. Good food is too cheap in this country although that doesn’t help the thousands of people on the breadline. Farmers don’t earn very much and that is why many of them are simply giving up. Last year I visited Featherdown Farms where the farmer no longer bothered to sell his potatoes, which were of high quality, because it wasn’t worth it by the time distribution, transport, cut taken by the supermarkets was counted. The mark up in supermarkets on fresh fruit and vegetables is around 45% whereas junk food is sold with a profit of pennies. It’s all wrong, all topsy turvy. Do you think we spend enough on food? Is spending a fiver on a jar of tomatoes absolutely ridiculous? Maybe splashing out a fiver as a tin of tomatoes might be worth it… Crap tinned tomatoes are just disappointing. No flavour – at least buy organic if you can. Tomatoes is one of those things where you have to spend the money: fresh or tinned. To be honest, I don't splash out massively on a tin of tomatoes, I tend to buy KTC at 33p for a can. They work, they're fine, my son (and me) both LOVE the tomato and pesto sauce I make with them. I would suspect the comments may be targeted at the fact that cheaper brands like KTC and own brands (apart from Waitrose and Ocado) were not tested. There are certain things I will spend a lot of money on but a tin of tomatoes are not it. I won't buy value whole tomatoes because I agree they are minging but are there decent cheaper brands out there? Yes. 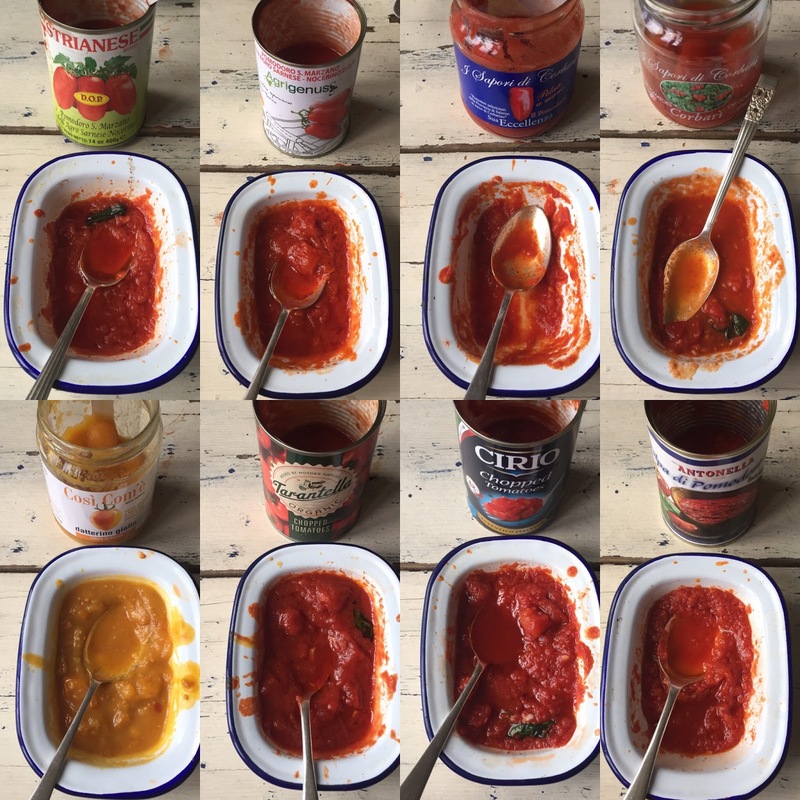 We also tested Heinz, Napolina, Mr Organic. If you'd tasted all the tomatoes side by side, as we did, you'd be amazed at the difference. If I were doing a curry, I'd use KTC but if I wanted a delicious pasta sauce…I'd be reluctant. Not pure tinned tomato, but Maggi rich & rustic tomato sauce is a really useful store cupboard item. Interesting score for the Napolini. 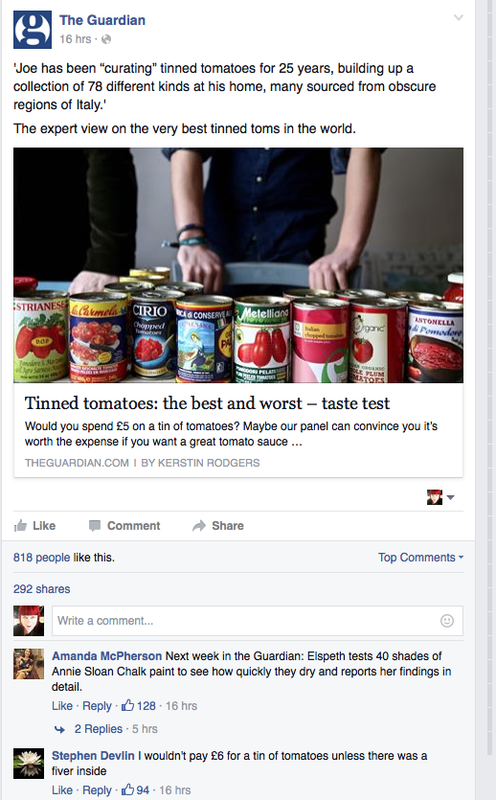 I would pay more for tinned tomatoes to be honest. A fiver once a week to make an incredible tomato sauce wouldn't put me off as was spend just as much, if not more on meat or fish for a meal. What does put me off however if the availability. From Italy, you are looking at £50.00 postage, £12.00 from the UK and that does put me off. If I could go to a local shop and buy it though I probably would. Kelly, you can order some from Andreas Veg he's doing an online shop but the site isn't live yet. But if you email him he'll happily send you some if you don't live in london. Wow, It's looking so tasty and yummy. My mouth is watering, when I see this tomato maggi. I always make this in free time. All my family members like to eat tomato maggi. Thanks for sharing. Great combination of tomato sauce with pasta recipe. I love pasta with tomato sauce. I normally make this recipe in my free time. All my family members always praise me for this recipe. Thanks Anna! Why don't your scores match the ones in The Guardian article? No, e.g. Cirio 3.5 in Guardian, Antonella, 8 in Guardian. You give them 4.5 and 7 respectively. Makes me wonder if the Guardian widened the gap between supermarket and expensive ones to make for a stronger article? hmm, weird, it was so long ago I've forgotten but I wrote this up from my original notes. I was more forgiving of supermarket brands than Dino who was on my panel. Chef, photographer, author, journalist, blogger. Pioneer of the supperclub movement. This is my food and travel blog, with recipes, reviews and travel stories. I also stray into politics, feminism, gardening.